5:30 AM – Today’s the day I run a half-marathon. I’m up early to go join my carpool down to Huntington Beach! An update will be forthcoming upon my completion of the race and return to Hollywood! 2:30 PM – Did it! Proud, tired, and sore; but again oh so proud. We’re quickly (as quickly as I am able to move) getting ready to go out again to a Superbowl Party. A “real” update on the race will come later tonight or tomorrow. Pictures included! 5:30 PM – Well, 5:30 PM two days later… Yup! I’ve finally got photos up and I’ve recovered enough to talk about my experience. It was wet and cold. Wet and cold. Wet and cold. Consequently, the running didn’t seem nearly as bad as the wet and cold! So, I’m actually still excited to do it again. We started in the 7th wave of people at about 8:00 AM, about 30 minutes or so after the fastest runners had started. It was raining. …or as I like to call them – Dandy Long Legs. At about Mile 5, we caught up with Jessica and Lonnie. After the “big” 6% grade hill, Lonnie took off and Jessica joined Caleb and I in our Dornbush Chase. It certainly wasn’t difficult to keep an eye on Ryan’s head bobbing up and down above his bright blue shirt. Once we came down off the hill and were back on the PCH, the wind from the ocean was bitter cold and although it was heavy, I was glad to be wearing my soggy yellow jacket. What you won’t see is a picture of me in my garbage bag skirt. I’d brilliantly worn cotton shorts on a rainy day. But thankfully I’d brought a garbage bag with me so I wore that over my shorts. It helped! 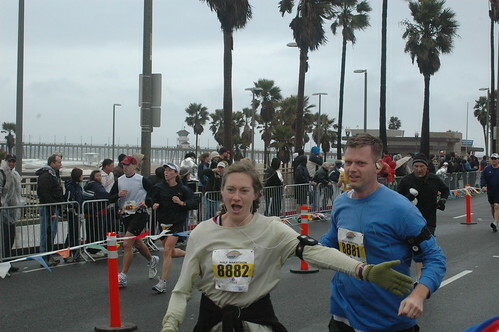 I removed the bag about 4 miles before the finish line so as to avoid embarrassing photos. The equally neat and occasionally demoralizing thing about the Surf City Race Course is that the majority of it is on the PCH – you run out, you run back. So for most of the first half, you’re watching people on the other side of the road heading back towards the finish line. They’ve run farther, faster, and they’re on their way back. It’s fun to see (and cheer for) your friends as they pass you. But it’s a constant reminder that you’ve got more running to do! Until you make the turn yourself… Actually, I was surprised that not many people cheered as they made the turn! I was excited!! It was here that my left foot started feeling like it was running on knives. But I kept going! I knew, from running the 12 miler two weeks previously that the blister forming on my arch wouldn’t be too bad – that I could run through it and that there would be no permanent damage – so I did my best to ignore that pain. But little did I know that my toenail was out to get me! 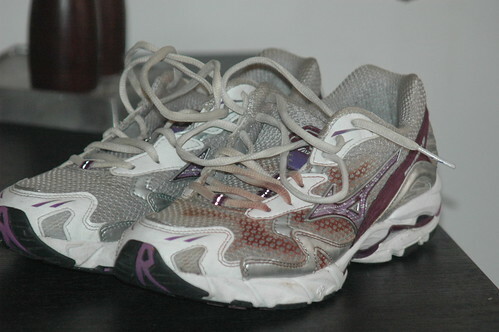 I didn’t notice until hours after the race was over that my left shoe had all but turned pink! From blood and rain! My one toe had gouged a hole in my other toe… Yummy. The rest of the race felt like one big long miserable moment of pain. Except for the pee break at mile 10! After that, I had renewed energy, and my muscle didn’t cramp up! They knew. Once we’d passed mile 11 and realized that there was only 2.1 miles to go, I felt a surge of excitement carry my legs a little faster! For about 5 steps. Then my body remembered that I’d already run 11 miles and it felt tired again. But we kept going. One leg in front of the other. For 2 more miles. It was painful, but possible. The neat thing about training for and accomplishing long distance races is that you learn so much about life in general. Metaphorically. Sometimes the path is painful. Sometimes you’re in the middle of your journey and you’re cold, and it’s raining, and you wonder why you’re on that path in the first place. But you remember that at the end is a generous helping of accomplishment-sense and a really great massage. Even just being in the pack of people, moving forward with bobbing, cow-like monotonous cacophony, is so much like the droning on of life. You have to find your own path. Yet you must do it conscious of your running partners and your race partners. I’m not eloquent today; but I am excited about long distance running. 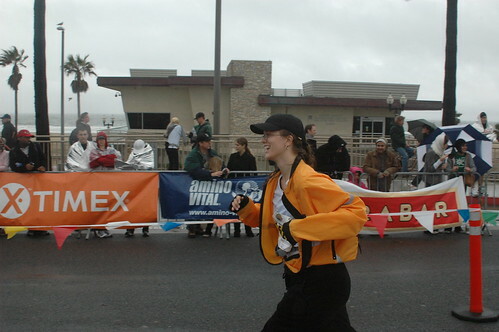 I plan to do another half-marathon or perhaps a short triathlon before attempting a marathon. But I will attempt a marathon. Some day. Here’s a photo of all the Act One friends who raced with me. Your dad and I are proud too. Looking forward to pictures. Love that first picture! Love the smile. shoot i can’t read more where it says (MORE)! is it supposed to be a link? maybe somethings screwy on my end…. anyway the first half recap was wonderful and i am very proud of you too! for braving the wet and cold and logging 13.1! go gilliegirl! Oops! Sorry Sarah! That’s because I hadn’t written more. I meant that more of an update was coming later. Ryan and I popped out for a movie last night so I didn’t get to finish my post! If you click on the first picture, you’ll be taken to the whole set from the race that Ryan took!